June 22nd (the first event) – 12 noon until 5pm – Tulin Dance School Annual Picnic & Students’ End Of Year Performances. A stage and p.a. system will be installed for the performances. Other activities throughout the day including bouncy castle, clown show, outdoor games, face painting, and arts & crafts. July, to be decided – The previously advertised public opening and launch of Dalston Square. August 9th & 23rd – Visits from the Hackney Playbus, a double decker bus that has been converted into a fully self-contained play facility for the under fives. August 16th – Watching The World Go By by Mimbre. Mimbre, a hackney based charity supported by the Arts Council England, have created a nuanced, breathtaking, and highly skilled acrobatic theatre production using circus and dance innovatively as a physical language to illuminate human connections. The production will feature 8-12 year olds from Mimbre’s children’s workshops, along with a, still to be found, group of 50+ year old local residents. This older group will need to participate in a group of 3 workshops running each of 3 days prior to the big event, to learn and practice the routine. If you are local, over 50, and interested in taking part, contact Lina (of Mimbre) at lina@mimbre.co.uk. October 6th to November 28th – The Expert View (a light-box exhibition). This is a stunning all-weather installation of 10 illuminated light-boxes displaying an exhibition of ‘Diary Drawing’ artworks by artist Bobby Baker, alongside selected work produced by others in response. The presentation was created by Daily Life Ltd., an arts and mental health charity, again funded by the Arts Council England, who aim to investigate and celebrate daily life and it’s limitations, promoting the abilities of people who have experienced mental distress in some form. One last thing to say on this subject is that a call has been put out for volunteers to help get the square ready for these public events (like erecting the pop-up tent for example). If you live in the square or the surrounding area and can lend a little muscle on the occasional weekend during the summer, please do let me know by email at DalstonSquareRA@gmail.com. All I need is your name and a means of contact (an email address and phone number would be ideal) and I will compile a list to send on to Lucy McMenemy at the council. Thanks in advance if you can help out. Before I finish up this post, two quick mentions for posts over at our discussions forum. The first is regarding fire safety within the Dalston Square development (also relevant to residents of other purpose-built blocks of flats) and what to do in the event of fire, which can be found HERE. The other is concerning the route of the proposed rail link Crossrail 2. After last year’s public consultations the route has changed: It will now pass through EITHER Dalston Square OR Hackney Central, not both. For full details of the proposals, access to TFl’s online survey, and details of the next round of public consultations, visit THIS thread. First a quick piece of half-news: The last retail unit is now being worked on. Top of the stairs as you leave the Square heading for the rear entrance to Dalston Junction station, the last piece of the Dalston Square commercial jigsaw slots into place. Although I am still unsure of the name of the restaurant or the owner, I can confirm it is to be a Japanese restaurant. More to come when I learn of it. 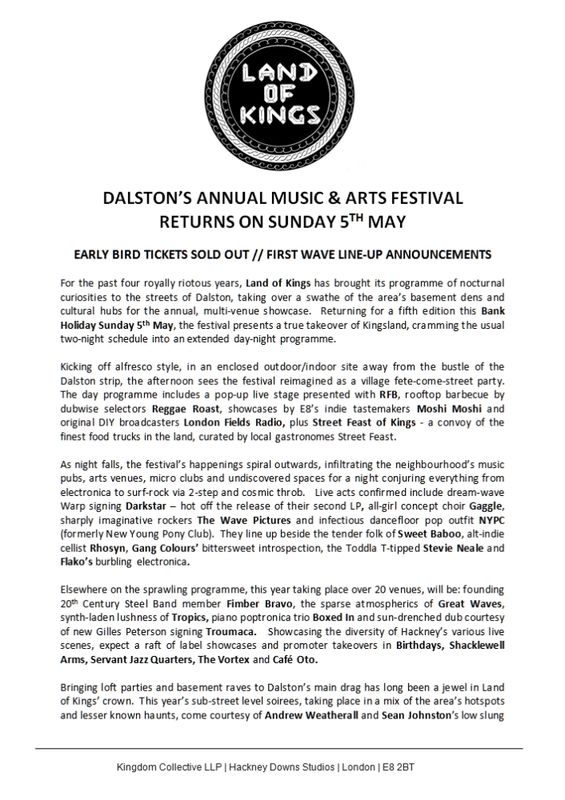 Now news of a new project running in Dalston for the duration of March (and beyond?). Many of you will be aware of services like Yelp that can point you to the right bar, cafe, and/or restaurant when you want it (particularly great as a smart-phone app). How about a research tool that allows you to comment on, not just food and drink establishments but, everything an area has to offer. And the ability to read other peoples opinions of course. Below is the poster that launched the project over the weekend. 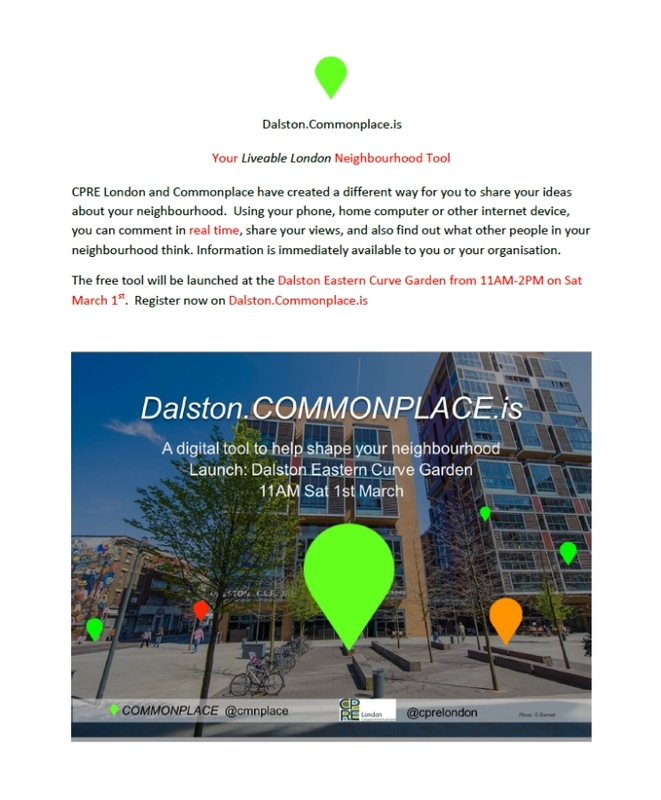 In their words “… CPRE London and Commonplace have created a different way for you to share your ideas about your neighbourhood. Using your phone, home computer or other internet device, you can comment in real time, share your views, and also find out what other people in your neighbourhood think. Information is immediately available to you or your organisation…. 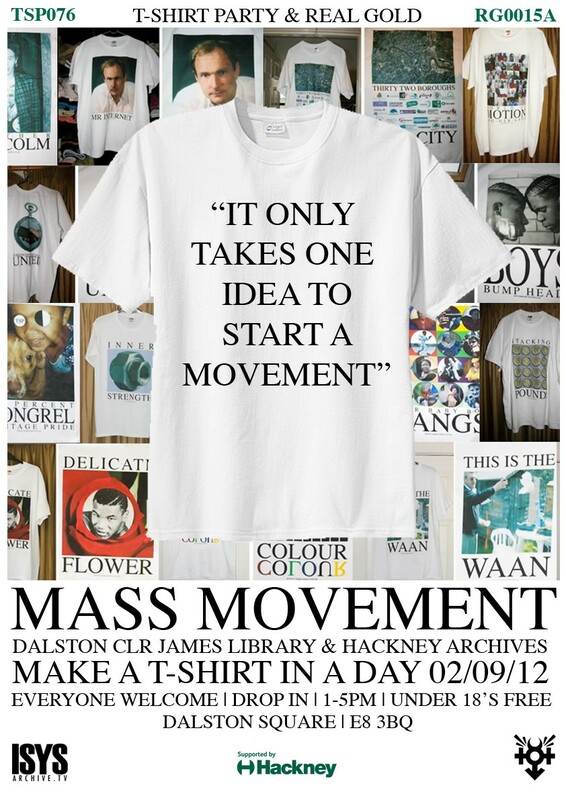 Register now on Dalston.Commonplace.is…” A chance to get your geek on. 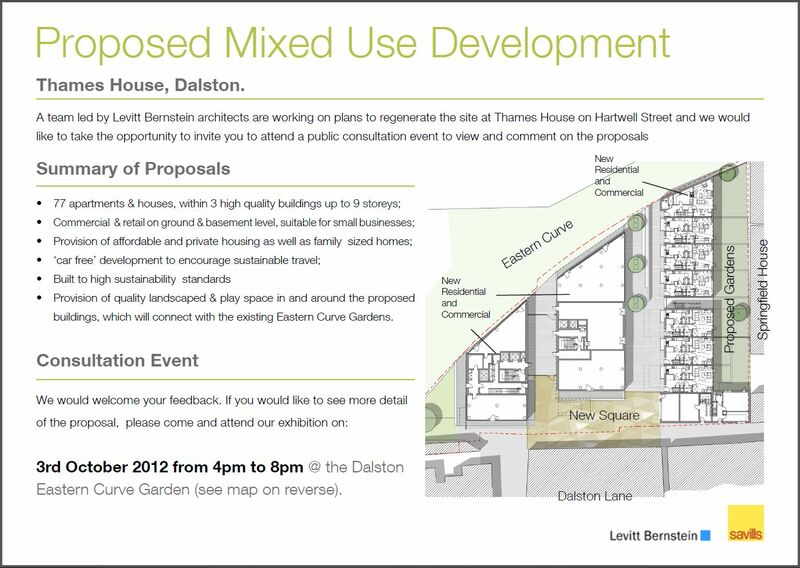 Two topics today for your consideration, the first being the latest licence application for Dalston Square. Nancy’s Pantry (also on Twitter HERE) will be opening in Unit 5 (the Barrat sales office) in February. In an email communication with the DSRA they told us “Our aim is to deliver the most family friendly restaurants in the UK, starting with our flagship site in Dalston…….. To create a space that is as fun for children as it is for parents, somewhere to eat great food, relax and where the kids can enjoy activities and have fun.” We were also told their business hours would be 8am until 6pm. All sounds very promising and a very welcome addition to the Square I would say. Sadly, their licence application includes a request for a liquor licence allowing them to serve alcohol from 8am until 1am. If this concerns you, full details of their application, plus how to voice your opinion to Hackney Council’s licensing board before they make a decision on the application (all submissions to the council must be in by 17th December) can be found in a thread on our forum HERE. Nancy’s Pantry have been made aware of our concerns and were yesterday invited to our forum to comment. Hopefully we can come to a agreement on what licence is needed for their business to succeed, rather than a carte blanche licence that could be abused by some future proprietor of that premises. Head on over to the forum thread and give Nancy’s Pantry your opinion now (everyone can read the forum posts but to contribute you will need to register: A very simple 2 minute process). The second topic is laundry. As you will have noticed, but for ads beneath each post if you click into them (this is put there by the company hosting our website and drastically reduces our hosting costs), there is no advertising on this website. If, however, a local business wishes to offer residents of the Square, or indeed all Dalston residents, a discount, I am happy to let you know about it. I am also more than willing to help promote the businesses actually in the Square (I should also stress that no money ever changes hands for this promotion). Such is the case with Laundry Republic. They have been operating a service for Dalston Square residents, via the concierge desk in Gaumont Tower, for quite a while now, but are running a promotion (with some nice discounts) to build their existing client base. So, if you are interested in a service that will collect your dry cleaning/laundry/alteration needs/shoe repairs from the concierge and deliver them back once completed, and like to take advantage of first time user/resident discounts, check out their post in the forum HERE. Hi all, sorry for the late notice on this one. As most of you will be aware, a group of residents from the southern end of the Square have organised themselves into a group to fight several aspects of the proposed development of the Holy Trinity School site (more details can be found over at our forum in THIS thread). To this end they have arranged a meeting with a representative from Planning Aid (website HERE), who will be offering advice and answering questions. The meeting is set for today (again, sorry for the short notice), at 2pm, in Cafe Route, here on the Square in Gaumont Tower (why not arrive nice and early and have a spot of lunch first: I can testify that the food really is very good). Some of you will be aware that our Service Charges are due to increase again this April. Leaseholders received a letter this week from Consort Property Management (dated March 12th), which is somewhat confusing. It describes ‘an increase of between £1000 and £4000 per apartment… dependent on the block’. If these figures are correct, they are alarming. They do not reflect the provisional figures the DSRA committee was given in a recent budget review meeting with Consort, but they do confirm the need to attend the meeting next Tuesday, to ask questions. For the past three years the Residents’ Association has asked for greater transparency in budgeting and more accurate predictive information for Service Charges for each apartment, to be sent out well in advance of the new financial year. This is to avoid the surprises many of us have had in past years from late notices of increases, based on unexplained or questionable cost increases in running our buildings. The increase in Service Charges will impact on ALL residents including tenants. We are very concerned about the confused message from Consort and hope that as many residents as possible will attend the meeting on Tuesday March 19th, at 6:30 in the library. We need a strong showing to impress upon Consort that we expect better from their financial management, and better value for money for their Service Charges. If you can, please come to the meeting to make your case. I cannot stress enough how important it is for as many residents as possible to attend this meeting. And that includes renters as well as owners: If costs continue to rise for owners, eventually rents will increase to compensate. Next, an update on the proposed development of the Holy Trinity School. Further to my announcement HERE (down near the bottom of the post), the plans have now been submitted to Hackney Council. There is a forum thread discussing this issue in depth HERE. Anyone wishing to object to this development can do so on the Hackney Council website HERE. Lastly an update to my post including details of Land of Kings (HERE, second paragraph). 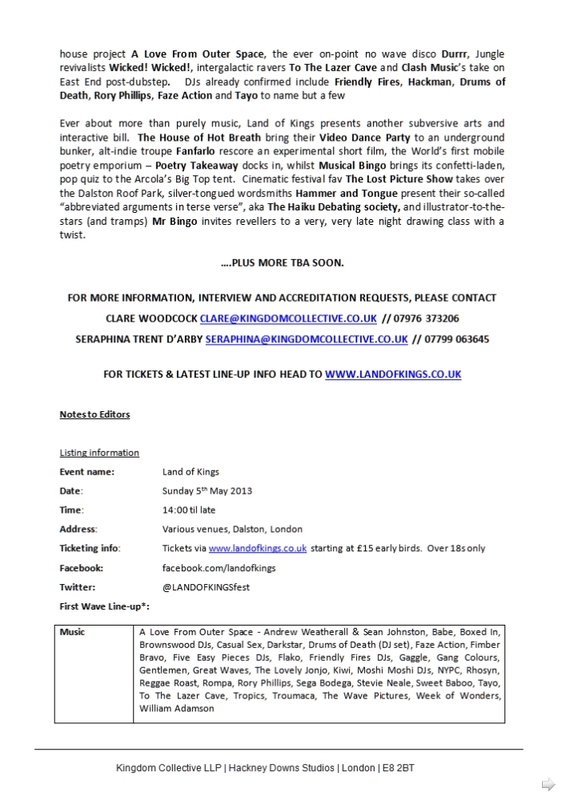 Nick has sent through a copy of their event poster and full event details which I have included below. Click each thumbnail to see the full size version. Further details on the family oriented Land of Kids will follow. First things first. a very happy, healthy, and prosperous 2013 to you all. I have a bunch of things to mention, some of which you may be aware of but almost certainly not all. So here goes. Firstly, a quick reminder that Thursday 10th January (this coming Thursday) is the date for our next DSRA meeting. As usual the meeting will start at 7pm (likely of 90 minutes duration), but this time it will be held in the C.L.R. James Library (in the meeting room upstairs). 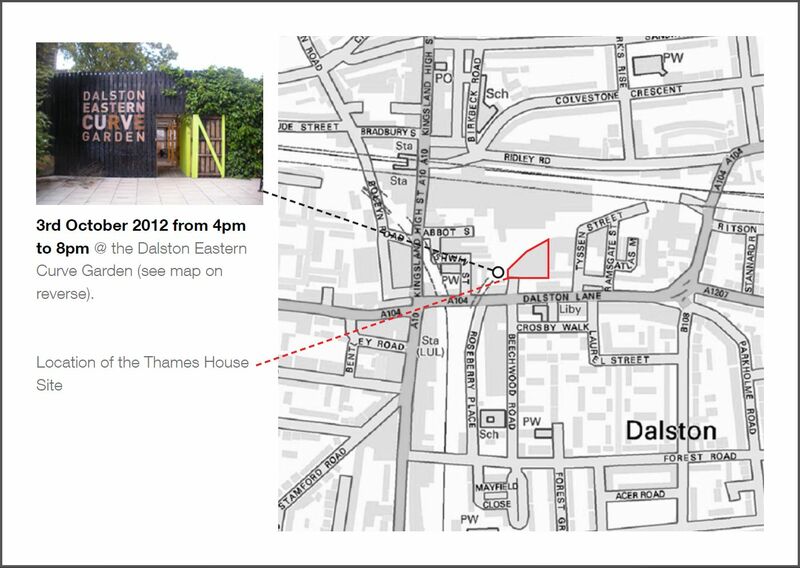 As always, the meeting is open to ALL Dalston Square residents, owners and renters alike. Full details, including the agenda, can be found HERE. Next, dates are now set for the next 2 presentations of the proposed development of the Holy Trinity School site (the school on Roseberry place at the south end of the Square). This will give you the opportunity to see the latest plans of, meet the team behind, and share your thoughts on, the proposed 11 storey development. Both will be held in the school itself (entrance on Beechwood Road) with the first being on Thursday 10th January from 4pm to 8pm, the second on Saturday 12th January from 10am to 2pm. If you did not manage to attend either of the previous events, I suggest all residents try to attend one of these (there is a slight overlap between the Thursday event and the DSRA meeting so why not do one after the after? 😉 ). Next, I just want to be sure you all have the correct contact details for the on-site Consort staff. To contact the concierge desk (the number changed fairly recently) the old mobile number is no longer valid and the new land-line number is 0207 2547341. To contact Sean Stone (our new development manager) phone 0207 2490896, or email sean.stone@consortpm.co.uk. One last thing before I leave you in peace: Previously I have mentioned resident Maisie Collin’s ‘Dalston Square Collective’ (a collective for self-employed and freelance people), details HERE on the forum. Well, Maisie has been busy advertising her idea and building support and has now expanded her idea to become ‘The Hackney Collective’ (though it will still be based here in the Square). The local on-line press recently did an article to promote the idea which you can find HERE. If this sounds like something for you, check out the forum post I have linked to to make contact with Maisie. Okey dokey, that’s it for now. Enjoy the rest of your weekend folks. Hi folks. I have received an update email from Lucy McMenemy (our friendly local council cultural events manager) to share with you all. October is Big Draw month, and with funding from the Arts Council, we are being encouraged to get creative. Things kick off this coming weekend (saturday 6th October) with a drawing workshop for kids. The event will take place in Dalston Square (weather permitting), in the CLR James library, and the Eastern Curve Garden. This is completely free of charge and will run from 12.00 noon until 3.30pm. The following weekend (saturday 13th October) will see a comvmunal sculpture project taking place in Dalston Square, open to everyone of any age, using plumber’s tubing and hundreds of elbow joints. This will run from 12.00 noon until 5.00pm. There will also be events the following 2 weekends but as they are outside the Square and I am writing this post on my phone (I am currently on holiday in Lebanon – 35 degrees and sunny yesterday), I will let you visit the coucil’s website for details: http://www.hackney.gov.uk/dalston-square. All of these events are free of charge and deserve your support: Get out there! Hello again. News not specific to Dalston Square this time, but relevant as Thames House is right on our doorstep: The north side of Dalston Lane, to the east of the Eastern Curve Garden. As you will see from the literature below (click on the thumbnail images for the full-size version), this is going to be an extensive redevelopment comprising of 77 new flats and houses (a mixture of affordable family homes and private market apartments) as well as commercial space for small businesses. 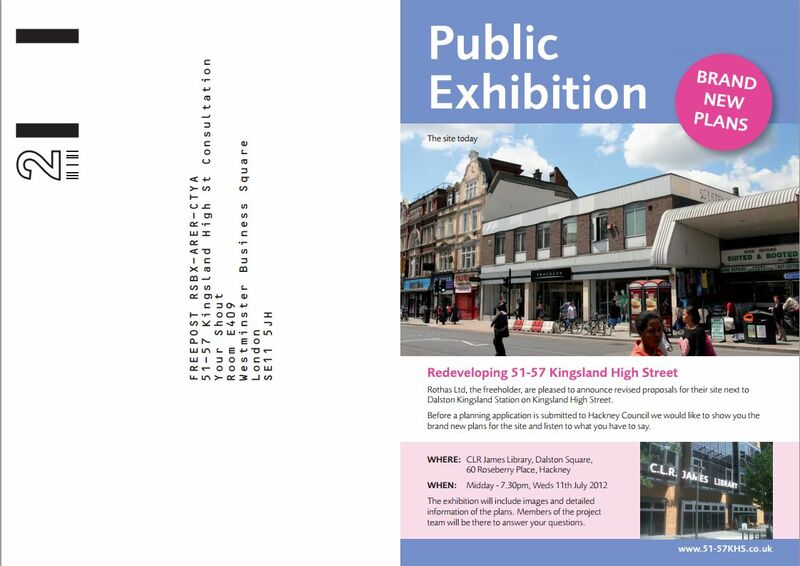 Due to it’s scale, there will be a public exhibition to consult with local residents on 3rd October, and anyone interested is seeing the plans or asking questions is invited (see the flyer below). Hello friends and neighbours. As you all know, we held a DSRA meeting during the week and I will be posting the minutes of that meeting soon. In the meantime, we did finalise plans for a late-summer get-together. 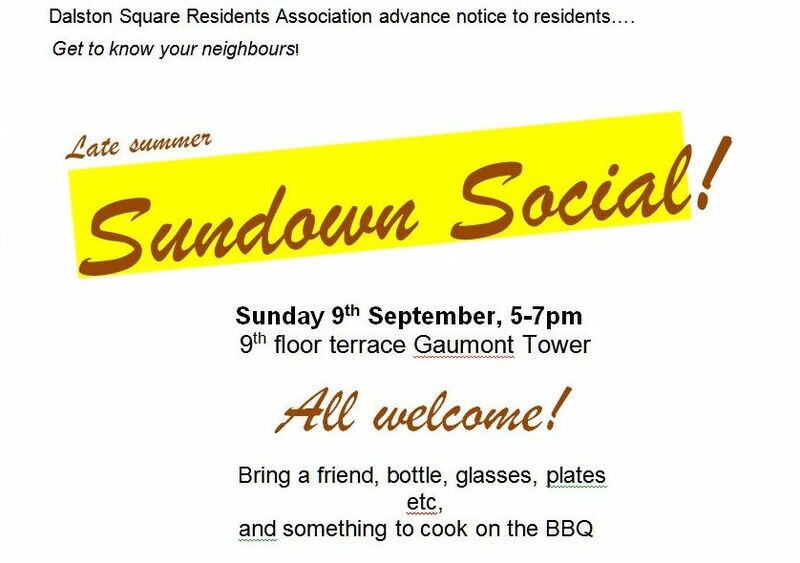 Open to all residents of Dalston square (and any friends you wish to bring with you), it will be a BBQ event held on the 9th floor terrace of Gaumont tower. The RA will (fingers crossed) supply the grill, so bring some food & drink (something to share?) a plate and a glass, and come to meet your neighbours! Click the thumbnail image below to see the poster with the details. Hello neighbours. Firstly, Gerard Hayes, our on-site development manager from Consort Property Management, is holding another surgery to answer any questions you may have for him: Wednesday 1st August, 6.00pm to 8.00pm. To reserve your 10 minute slot contact Gerard by email at gerard.hayes@consortpm.co.uk, or by phone on 0207 2490896. Secondly, a plug for a charity event. I am sure most of you are aware of Oxfam, and the incredible work they do around the world. Most of you will also be aware that they have a shop here in Dalston at 514-518 Kingsland road (just 2 minutes from the Square and recently declared London’s best charity shop for books and records by Time Out magazine – click HERE to read the article). Now, just for the sake of transparency I will tell you I volunteer one day a week to work in the shop (volunteers are always needed to help process donations and keep the shelves and racks on the shop floor stocked, so if you can spare a half-day or more each week, please do drop in and speak to a staff member). Also, instead of contributing to the local land-fill, please consider donating your unwanted items: No electrical or electronic goods please, but clothing, books, music & movies, general housewares and any other unwanted goods in good condition are always welcome. And so to the special event. Over the past several months the guys at the shop have been saving the high-fashion and quality designer and vintage clothing and accessories that have been donated. These will go on sale at a special late night shop opening on Friday 3rd August. 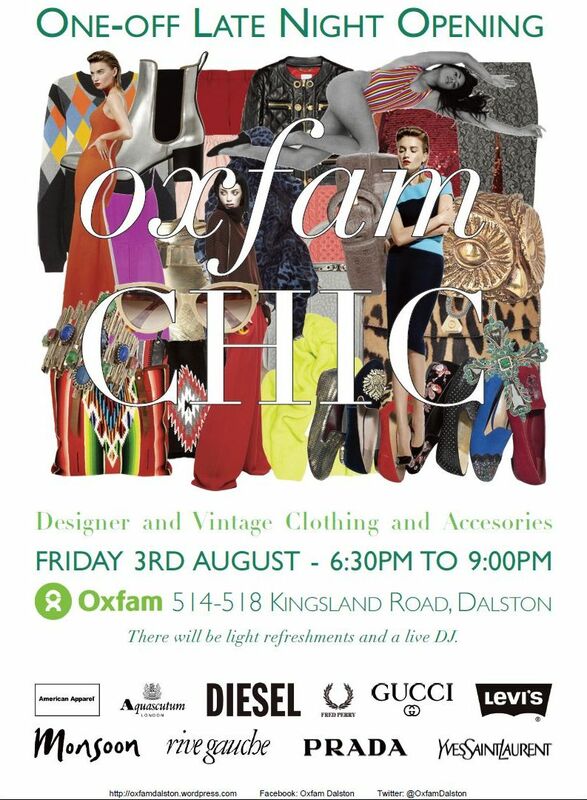 Titled ‘Oxfam Chic’, the sale will run from 6.30pm to approx 9.00pm. There will be light refreshments and nibbles available, and Steve, the shop manager, will be donning his DJ hat to supply some cool tunes. There really are going to be some amazing bargains to be had, so get yourselves along there! Click the pic below to see the full-size advertising poster (designed by the Squares own Stephen Humphries – thanks Steve). Hello friends and neighbours. 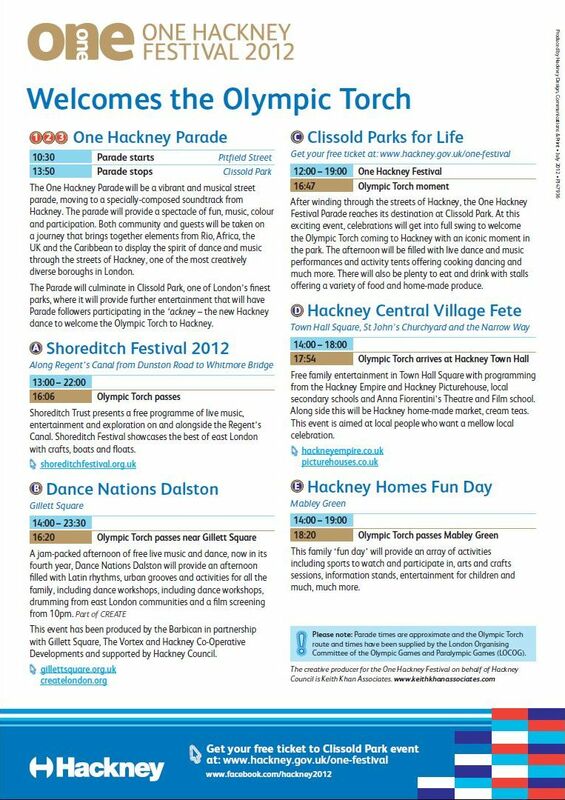 I have received another event flyer from Cory Defoe, Town Centre Manager from the Regeneration Delivery Team of Hackney Council, to share with you all. 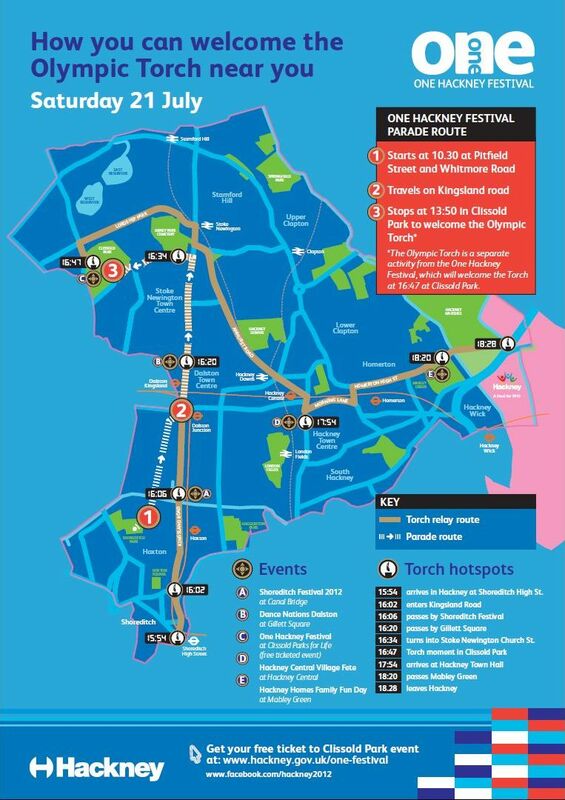 This flyer covers the course of, and events surrounding, the Olympic torch through Hackney as a whole. 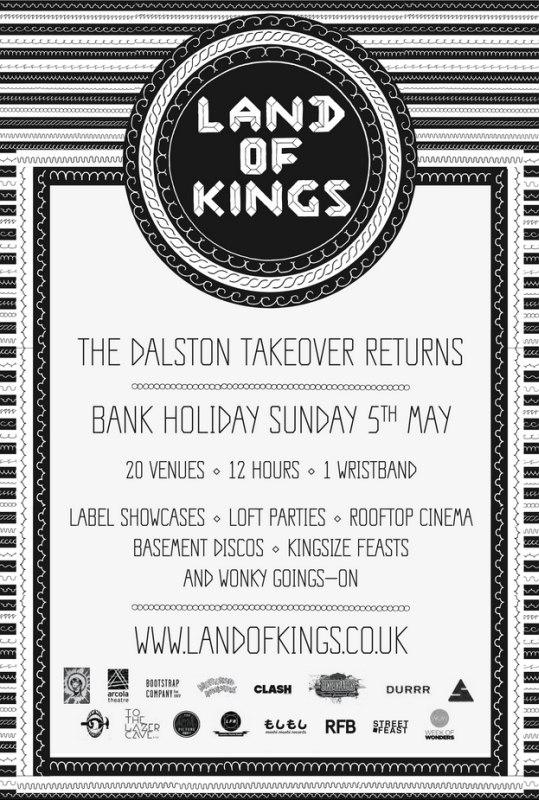 There is a Dalston specific flyer in the works and I will share this with you as soon as I receive it. Click the thumb-nailed images below to see the full size version. Apologies for the short notice on this, but I have only today received it my myself. 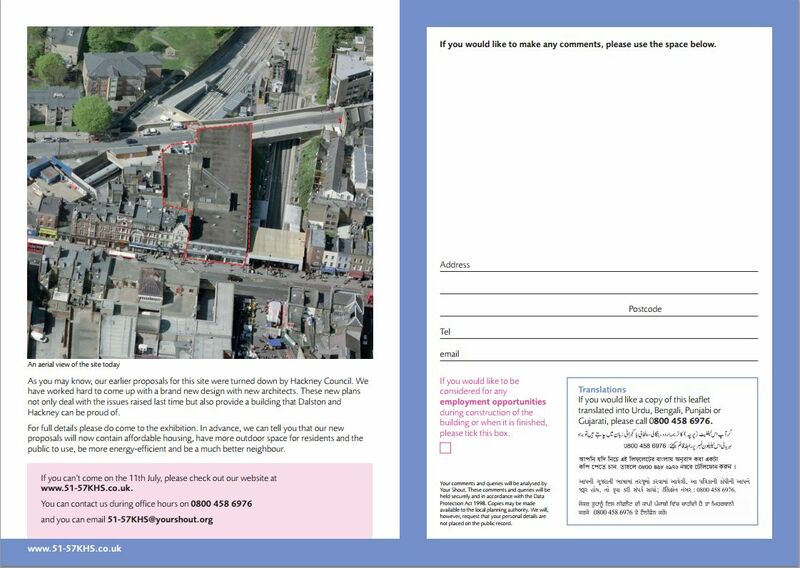 As some of you may be aware, an application to Hackney Council to redevelop 51-57 Kingsland High Street (the current site of Peacocks’ shop, next to Dalston Kingsland Station) was rejected last year, in part I believe because of pressure exerted on the council by local residents (it was an interesting design but far from ‘in keeping’ with the rest of the high street). Now there are new plans afoot. The Council is holding a public exhibition on these new plans, to include images and detailed information of the proposal, in the CLR James Library, here in the Square, Wednesday of this week (11th July). The exhibition will be open from 12 noon until 19.30, and members of the project team will be there to answer questions. Below is the info leaflet I received this afternoon (click on the images for the full-size version). As you may or may not know, Dalston Square is the largest public space created in London since the 1940s. What you probably do not know is that the local council are very keen to make the Square a place for the whole community to enjoy (not just the residents) and, to this end, have created ‘The Dalston Square Culture & Community Engagement Forum’. Though the Square is still some way from finished (early 2013 is the latest estimate I have heard for this), some small events have already happened: You surely saw the kiddies climbing wall some weeks ago, and if you were lucky you caught one of the 2 contemporary dance performances a couple of Saturdays ago (I have to say dance is not normally my thing but I thought it was great: Very clever and imaginative). 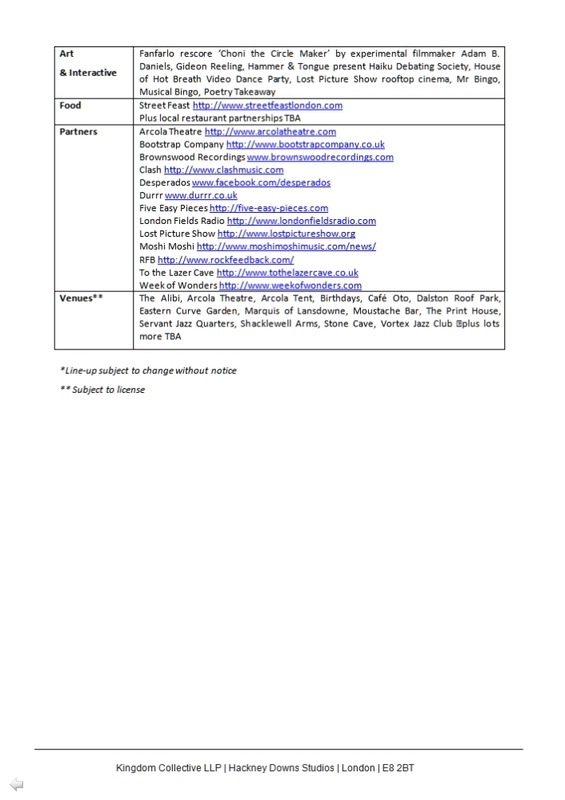 Anyhow, the Engagement Forum held a meeting a couple of weeks ago and I have been sent a copy of the minutes of that meeting, by Lucy McMenemy, the Cultural Programme Officer for Dalston at Hackney Council, so I could share them with you all. 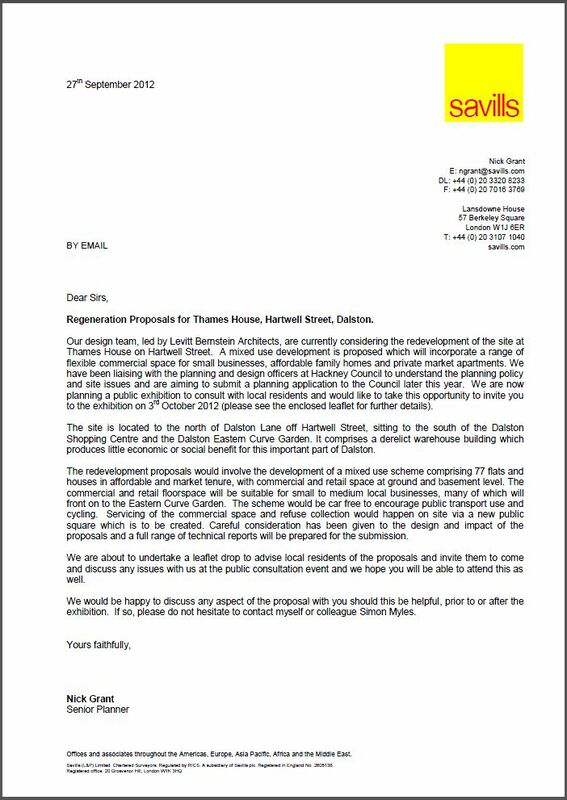 I for one am very pleased to know that the local council are serious about making the Square not just a great place to live, but a public space the whole community of Dalston and beyond can enjoy. I have posted those minutes in a new thread over at our discussions Forum which you can access directly by clicking HERE.